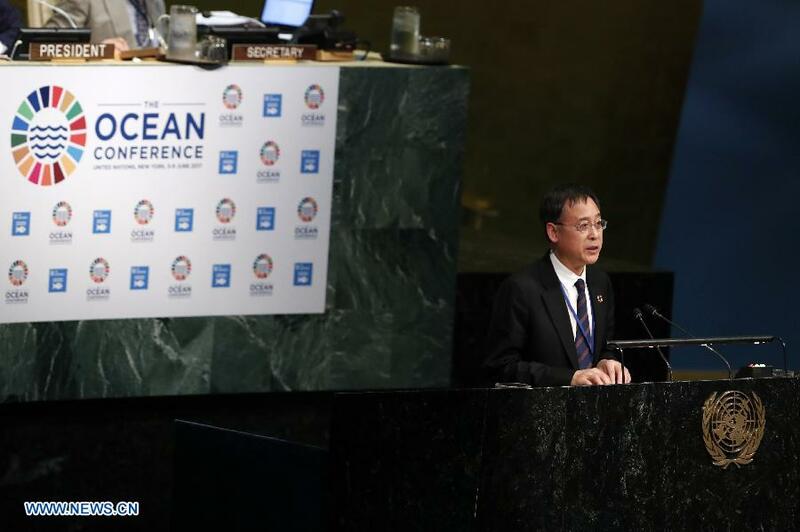 UNITED NATIONS, June 7 (Xinhua) -- A Chinese official attending the UN Ocean Conference here on Wednesday called for enhancing equality and mutual trust in the global ocean governance. The international community should "build a blue partnership and enhance equality and mutual trust in the global ocean governance," said Lin Shanqing, Deputy Director-General of the State Oceanic Administrations of China at the plenary meeting of the United Nations Conference on Marine Sustainable Development. "China is willing, based on its own development experience, to work actively for the establishment in the area of the ocean of an open, inclusive, concrete, pragmatic, mutually beneficial and win-win blue partnership with other countries and international organizations," he said. The UN Ocean Conference is taking place at UN headquarters in New York from June 5 to 9, coinciding with World Oceans Day, which falls on June 8. Co-chaired by Fiji and Sweden, the Conference aims to support the implementation of Sustainable Development Goal 14: Conserve and sustainably use the oceans, seas and marine resources for sustainable development. Lin told the meeting that China, like some other countries, is confronted with challenges of ecosystem degradation and frequent ocean related natural disasters. "The Chinese government has noticed the inter-connection between Goal 14 and other SDGs, such as economic development, climate change, science and technology and poverty reduction," he said. China is implementing Goal 14 in conjunction with its own marine development undertakings, he said, adding that "we have linked this goal with our 13th Five-Year Plan on National Economic and Social Development and other mid- and long-term national development strategies." According to Lin, China's ocean related GDP in 2015 was about 6.5 trillion yuan (956 billion U.S. dollars), accounting for 9.4 percent of the total GDP and representing a year-on-year growth of 7 percent. Some 36 million people are employed in this sector. The deputy director also told the meeting that China has taken measures to protect the marine ecological environment. "A Regime of Marine Ecological Red Line Areas is established. Under this regime, important marine ecological functional areas, sensitive areas and fragile areas are designated as red-line areas where development activities are strictly controlled," he aid. Speaking of the linkage between China's development with the world, Lin said that the 21st Century Maritime Silk Road is especially closely related to China's implementation of SDG 14. "While seeking a good life for ourselves, we want other people to have a good life, too. We believe that we can have a huge bonfire only if all contribute to collecting firewood, and we can go far only by helping each other," he said. Lin called on the international community to "vigorously develop blue economy and promote a virtuous circle of marine development." He also appealed to all countries involved to "promote the development of marine ecological civilization and jointly assume the responsibility of global marine governance."